It is so hard to believe summer is coming to an end and back to school time is here already. I love strawberries all year long but, I know they are very popular in the summer season. 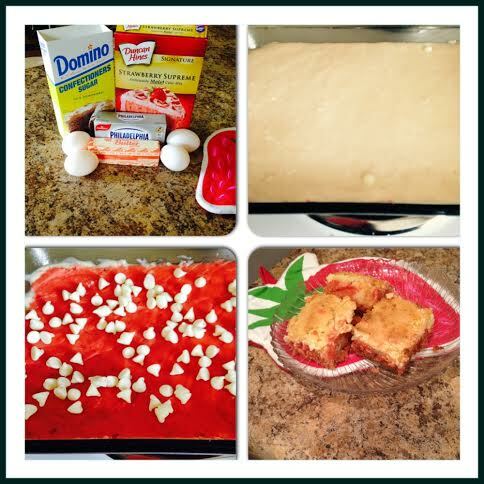 I just had to get in one strawberry recipe on the blog before the season ends. I made these white chocolate strawberry bars from a lemon bar recipe. I believe cooking is all about remixing and experimenting with different flavors. They turned out great on the first try and I have been making them ever since. I hope you enjoy! 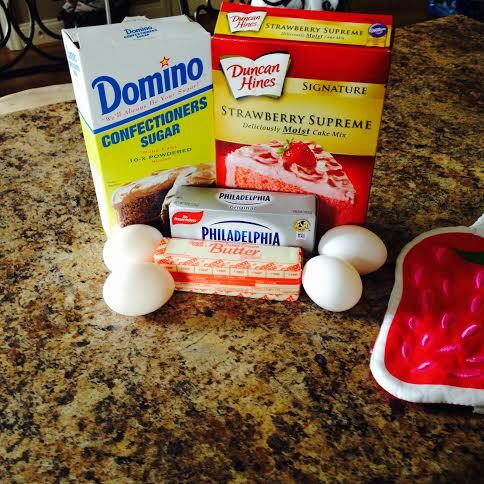 In a bowl combine strawberry cake mix, 1 egg, and 1 stick of melted butter. Mix all 3 ingredients well. Spray a 9 x 13 baking dish with Baker’s Joy. Add cake mixture in the baking dish and spread across the whole pan. Add white chocolate chips on top of cake mixture. Mix 3 cups of confectioner’s sugar, 2 eggs, and 1 block of cream cheese together with a mixer. Pour cream cheese mixture on top of cake mixture. Bake on 350 for 45 minutes to 1 hour. Enjoy!